Have you ever heard, “It’s just the flu”? The flu is a contagious respiratory illness caused by a virus. It’s more than “just” a minor illness, especially if you have asthma. The flu affects your lungs. For a person with asthma, the flu can irritate airways that are already inflamed. This can worsen your asthma. It can lead to serious complications like pneumonia and can be fatal. As of Feb. 13, 2019, 28 children have died from complications from the flu. About 7,000 people die each year due to diseases (including the flu) complicated by asthma. 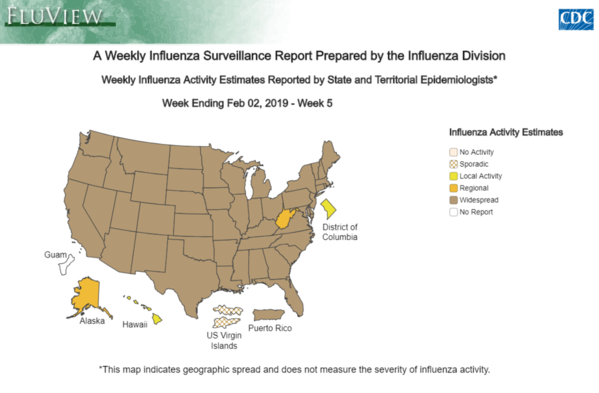 This graphic shows that flu is widespread throughout most of the 50 states. Photo credit: Centers for Disease Control and Prevention (CDC). Get the flu vaccine every year. It's not too late to get the flu shot. We're only halfway through the flu season. It can go as late as May. Common strains this year include mostly two Type A strains: H1N1 and H3N2.1 This year's flu vaccine included both of those strains, making it more effective. Studies show the flu vaccine can make flu symptoms less severe if you get the flu anyway.2 But remember, it takes about two weeks for the flu vaccine to take effect and protect you. Avoid habits that can expose you to the flu. Wash your hands well and often. Avoid sick people. Don’t touch your eyes, nose and mouth. Take care of yourself and get treatment. Talk to your doctor about antiviral drugs approved to treat flu and start them within two days of illness. Get plenty of rest, drink lots of liquids, and avoid alcohol and tobacco. Practice good asthma management all year round. Take your long-term control medicines as prescribed. Carry your quick-relief medicines everywhere. Control your triggers. Follow your Asthma Action Plan. Get your asthma under control as soon as you move into the Yellow Zone. If you manage your asthma well, you can reduce your risk of complications from the flu if you do get sick. What do you do to protect yourself and others from the flu? Take our survey and let us know. You can also join our free online community to talk to others with asthma and allergies about how you stay healthy during flu season. I never get to October without the flu shot. I had the flu years ago, before my asthma was so bad. No fun! Good for you in being proactive! That is a good way to help manage asthma. Dina, that is great that you are proactive and get the flu shot early in the season!